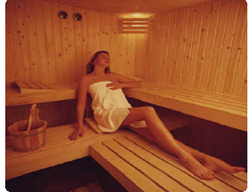 Fixed sauna is constructed with highest quality (imported) treated & seasoned pinewood. The wooden panels used have tongue and groove joints that take care of expansion and contraction as compared to flat panels used by other manufactures. A special Sauna Door capable of withstanding extreme variations in temperature between the inside and outside surfaces is provided. Sauna Room is constructed using a frame work of 35 mm x 50 mm pine wood cross-sections at a distance of 450 mm x 450 mm (c/c). The entire surface is covered with 25 mm thick resin bonded high-density glass wool wrapped in aluminum foil. The entire frame is sealed with water proof, fire proof, termite resistant & seasoned plywood. The inside of the sauna room is then covered on all six sides (including floor & roof) by 12 mm x 75 mm pine wood strips using tongue & groove joints. Sauna room accessories like Sand Timer, Water Bucket, Ladle, Heater Guard, Towel Rack, Robe Hooks, Headrest, Light Cover, Speaker Box made of pinewood are part of the standard sauna room. Thermometer & Hygrometer fixed in frame made of pinewood are also provided. A steam bath opens pores, soothes sore muscles, increases circulation, and provides a generally relaxing and healthy experience. People have indulged in steam baths for centuries, as the has practice spread across and among contintents. Now, modern technology has enabled the installation of efficient, carefully controlled baths at spas, fitness centers, meditation rooms, and in personal residences. For a very wet and hot health treatment, people often seek out a peaceful steam bath. This usually takes place in a sealed room with wooden benches, similar to a sauna, which is kept at an even temperature and filled with mist. There is a narrow range of optimum temperature for humans, around 112° F (44° C), that raises our body temperature without causing overheating. The circulating vapor must be replenished so the humidity remains near saturation for maximum benefits.You may find a steam bath at your yoga studio, local spa, health clinic, or stand-alone establishment that may also have hot tubs, saunas, or wading pools. A steam shower is a type of bathing where a humidifying steam generator produces water vapor that is dispersed around a person's body. These types of showers are becoming increasingly popular in many countries. A steam shower is essentially a steam room that offers the typical features of a bathroom shower. Steam showers are generally found in self-contained enclosures that prevent the water vapour from escaping into the main part of the bathroom, avoiding damage to drywall, paint, or wallpaper. Steam showers are available in a variety of materials, including but not limited to tile, acrylic, fiberglass, stone, and wood.